Why is Linda from New York city talking about beef dog treats and why should you care? New Yorkers love a bargain, but they also love getting what they paid for. With the price of housing in NY itself, many of us have to skimp and save and a lot of people think they do that on dog food. Other people pay an absolute mint for the highest priced dog pellets around but unless you regularly read up on the tricks dog food makers do with your dog food, you wouldn’t know how you are being ripped off right? Basically you and everyone else are feeding your dog a bag of wheat each week. Perhaps 20-30% low grade meat just to make up the protein requirement (by law). 2 Low grade grains are cheap, you are getting ripped off. You can bust your hump to find meat based dog food, but its going to be hard and very expensive. You can make your own as long as you know what you are doing, getting the type and proportions correct. But its messy and most people don’t have the skills / knowledge. And their vets will warn them against it – just buy the vet grains instead ! NOT beef flavor – but real beef meat dog treats. Beef because its plentiful, relatively cheap and has a good protein. If you get beef jerky you are doing even better. All dogs should be able to chew it and give them some gum exercising and teeth cleaning while they are at it. 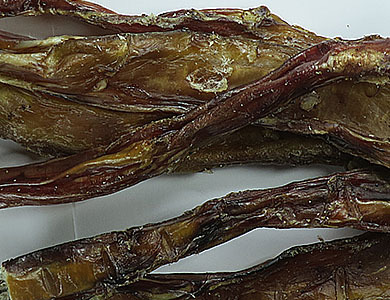 You can use beef pizzle for extra chewing, but its often more expensive and not all dogs can chew it down. The fat level is around 10% dry proportion, which is what it is from the cow. No additives or coloring wanted, fat that the dog would get if it pulled down a cow in the wild. Sure you can do as a snack or a treat, but if you aren’t getting meat into your dog as its regular food, you can step the beef strips of 100% beef dog treat as a food supplement or replacement. NOTE – experts from dog food companies tell you that you can replace up to 25% by dry weight a dogs dog pellets and still meet the dog food regulations. If you want to use more, then maybe look for what vitamin and mineral tablet you might include in your dogs food. NOT a dog tablet as these are ridiculously expensive and low in quantities. Just because your dog lives in New York or America in general, doent mean it needs to be starved from real natural dog nutrition !